People have been talking about J.D. Vance’s “Hillbilly Elegy” ever since it was published in 2016. The book is the focus of the Go Big Read Keynote Event at 7 p.m. Monday, Oct. 9, at Memorial Union’s Shannon Hall. The event is free and no ticket is required. A panel from the University of Wisconsin–Madison will share expertise on the book’s themes. Due to unforeseen scheduling difficulties J.D. Vance will not be visiting campus this fall. The panelists include Kathy Cramer, author of “The Politics of Resentment,” who will talk about politics and cultural anger; Professor Katherine Magnuson, who will discuss poverty and stress in childhood; and Assistant Professor Aleksandra Zgierska, who will talk about addiction, chronic pain and opioids. Vance grew up in Middletown, Ohio, and the Appalachian town of Jackson, Kentucky. He enlisted in the Marine Corps after high school and served in Iraq. He went on to graduate from Ohio State University and Yale Law School, became a principal at a leading Silicon Valley investment firm and a contributing writer to the National Review. He recently started a nonprofit group called Our Ohio Renewal, a nonprofit organization that describes itself as dedicated to addressing the state’s opioid crisis and bringing high-quality employment and educational opportunities to Ohioans. In the book, Vance tells the story of what it feels like to be born into a region and class that has experienced serious economic disruption. He shares his family’s story, starting with his grandparents’ move from Appalachia to Ohio following World War II in hopes of escaping poverty. But that escape proved difficult, especially for Vance’s mother. Ron Howard is directing and producing a movie adaptation of the book, which was a New York Times best-seller. Campus is already getting involved in the discussion. More than 5,000 copies of the book have been distributed to incoming first-year and transfer students at Convocation. Additionally, there are 145 course sections registered to use the book in their classes. UW–Madison police staff are reading and discussing the book, and so are students in the Odyssey Project, which offers humanities classes for adult students facing economic barriers to college. 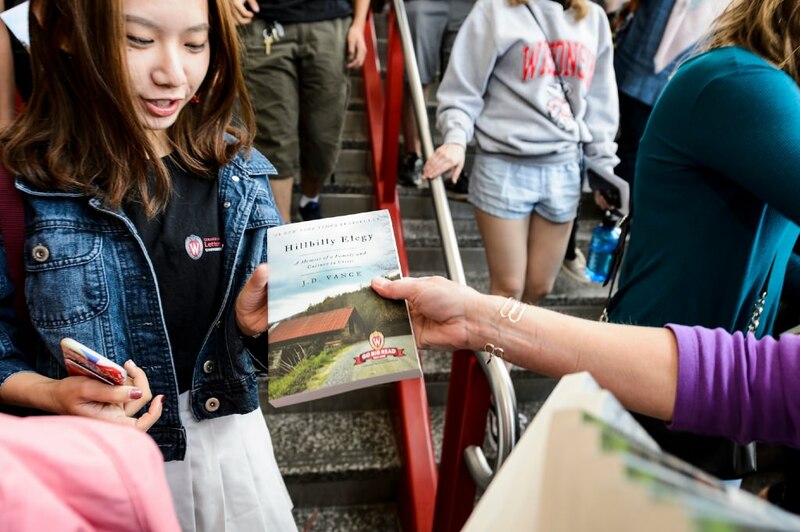 More than 500 Badger Volunteers are using the book for their fall orientation. The book has also been popular among many department/unit groups who are using it for discussions of diversity and inclusion. An audience question-and-answer session will follow the panel discussion, which will be moderated by Professor Russ Castronovo, whose own research focuses on politics and critical citizenship. “The hope is that people might use the book’s insights — and also its shortcomings — to work toward a more complex and nuanced understanding of education and social class in the U.S.,” Castronovo says. The keynote event will also be live-streamed and archived at gobigread.wisc.edu.